I have been looking forward to the Australian version of the Great British Bake Off ever since I heard it was being filmed. However I am starting to wonder if, when they advertised that it would air after Easter, they meant Easter 2014! While waiting, I have been revisiting the original British version and discovering the blogs of some of the past contestants. One of the things I have wanted to try for some time are Mary-Anne’s (Season 2) apple rose tarts. I found Mary-Anne one of the most interesting contestants on The Great British Bake off, with her recipes utilising unique techniques based on a lot of research and historical recipes (and a collection of over 900 cookbooks, which puts my 200 to shame). I thought these tarts were beautiful so I decided to try the apple rose component today while I was making a batch of Lemon Tarts from my second pastry making course (with Sarah Brigden from babyCakes). I won’t repeat the instructions here, as they are already provided so well by Mary-Anne on her site Time To Cook – Online. As I just wanted to try the roses today, I made the sweet pastry that I learnt in class, and a crème patisserie recipe that I had previously learnt from Sarah (which I will post in a few weeks). I followed Mary-Anne’s instructions to make the apple roses (although without returning them to the oven to bake). Although they are a little fiddly, they are very effective and I’m sure they get a bit easier with practice. I quite liked the freshness of the apple after poaching them in the apple syrup and not baking them further. As long as you chill the pastry well before rolling it, I think this pastry is quite easy to work with. I like adding some orange or lemon zest to the pastry for an extra citrus hit. 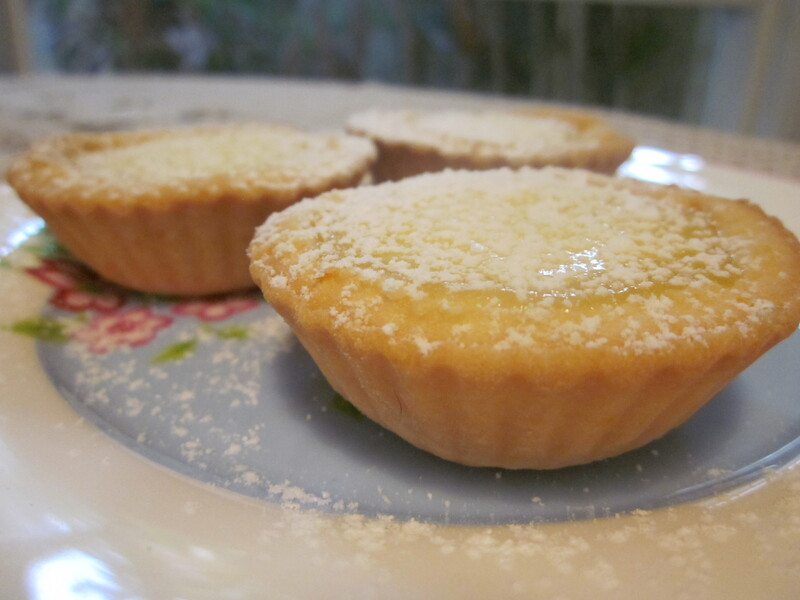 The citrus filling is beautifully creamy and tangy and I certainly recommend giving these a try. 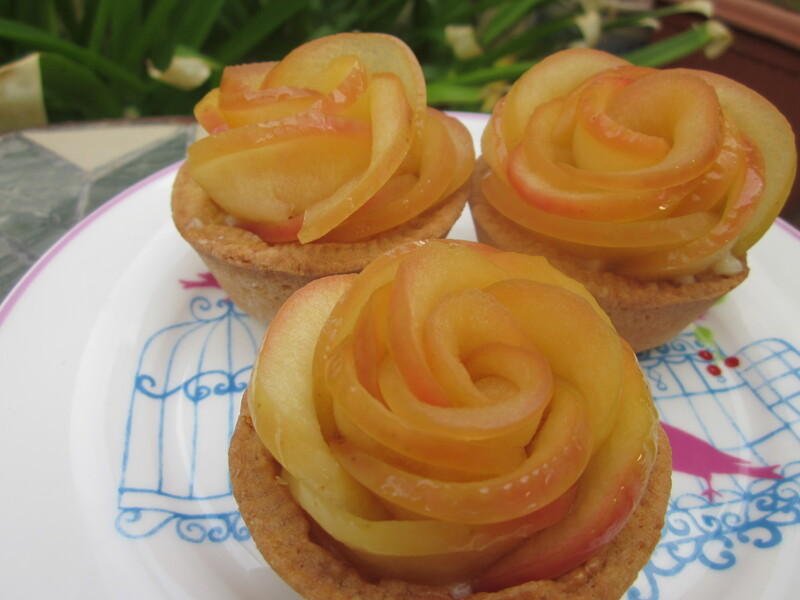 And the apple rose tarts look beautiful and very effective, and are not too difficult to achieve. Next time I will give Mary-Anne’s apple custard filling a go as well and bake the apple roses. For a chocolate sweet pastry, replace 40g of plain flour with cocoa powder. To make the pastry, mix together (with electric hand mixer or the beater attachment of a stand mixer) the butter and sugar until combined. Turn out onto a clean, lightly floured surface and knead until just smooth. Wrap in cling film and rest in the fridge for at least 30 minutes but preferably 2 hours. Once the dough has rested. Preheat the oven to 160C fan forced (180C) and spray two 12 hole muffin/cupcake tins (or similar tart tins) with baking spray. If the pastry gets too soft and sticky to work with, wrap in cling film and return to the fridge until it has hardened, then continue to roll. Once the tart tins are lined, return them to the fridge for 10-15 minutes before lining with aluminium foil and filling with baking beans (or uncooked rice/beans). Bake in the oven for 15 minutes (until the pastry is golden and only a little moisture remains on the inside) then remove the beans and foil and brush lightly with egg wash. If there are any cracks, repair these with extra pastry. Return to the oven for another 5 minutes (note – if you are wanting to make tart shells to fill with crème patisserie/fruits etc, cook for at least 10 minutes at this stage or until the pastry is dry inside and cooked). Meanwhile, make the filling by combining the zest, juice and sugar in a bowl. Whisk until the sugar has started to dissolve then add the eggs and cream. Mix until combine. You can make this ahead and keep in the fridge until needed. 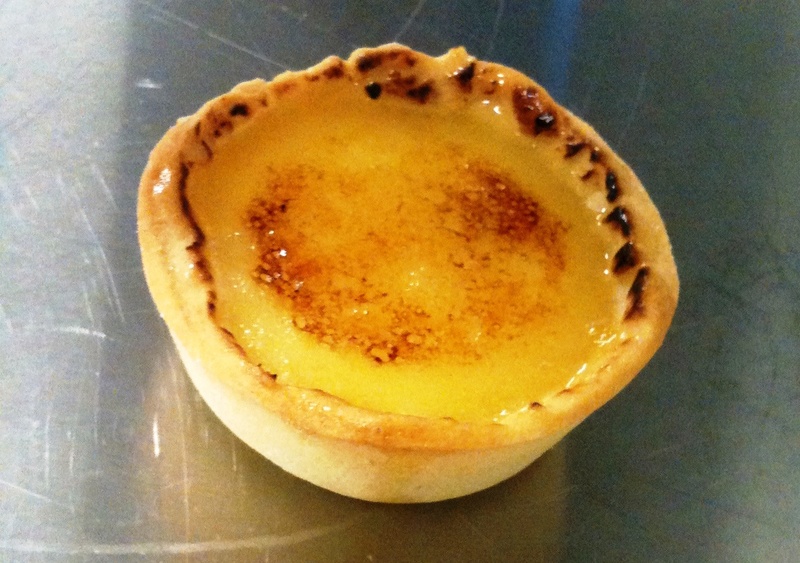 Fill each tart case with the lemon cream mixture, being careful not to overfill. Return to the oven and cook for about 10- 15 minutes or until just set. Remove and allow to cool before serving. If you wish, once cool sprinkle with extra caster sugar and brulee with a blow torch and then brush with the melted apricot jam. Alternatively, dust with icing sugar. If making ahead, store in the fridge in an airtight container. You can also use this recipe to make larger tarts. However, a longer cooking time will be needed. Thanks Mum, knew you’d like the roses :). I will definitely add the apple roses to my list. So gorgeous!